After a weekend with no road access to the outside world, officials in Fremont said they still don’t know when any will reopen. The flights were a godsend for Sue Ankersen, 56, who lives in the city but wasn’t able to return home after baby-sitting her granddaughter in Omaha on Friday. Ankersen said she had never flown in a small plane before, but heard about the flights from her daughter and worked up the courage to go because she was homesick and wanted to volunteer to help others. The makeshift shuttle flights have led to a surge in air traffic at the Fremont Municipal Airport and its two runways. Pilots have flown in from at least five nearby airports in Nebraska as well as others in western Iowa and Kansas, said Jim Kjeldgaard, the airport’s operator. He said pilots have taken passengers out of town to get to medical appointments, funerals and relatives who live elsewhere. They’ve also hauled water, food, toilet paper and other supplies. One pilot joked to Kjeldgaard that the airport was busier than Omaha’s Eppley Airfield, the state’s largest airport. 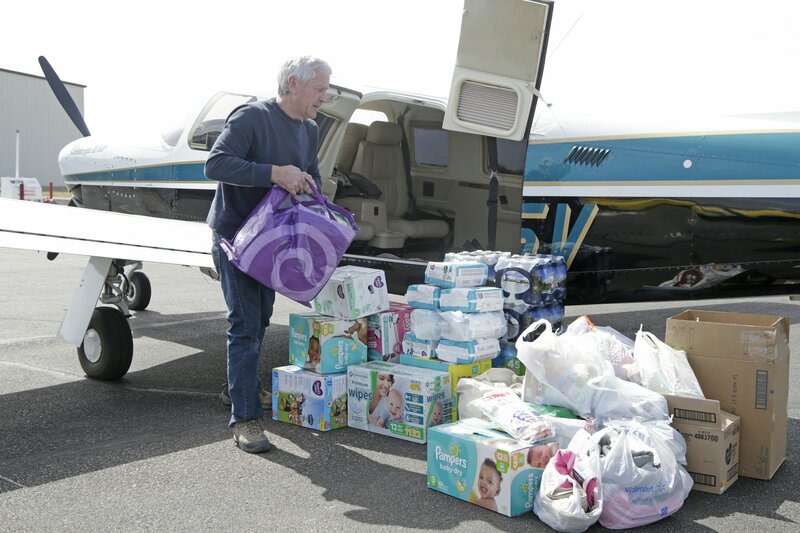 Herb Johansen, a pilot from Bennington, removed the back two seats from his Piper Saratoga so he could haul water, diapers, clothing and food into town along with passengers — mostly college students from Midland University. He said the airplane traffic around Fremont is “hectic, maybe even semi-dangerous” because so many pilots are landing and taking off from the small airport. Fremont City Administrator Brian Newton said it’s too early to say when the roads will reopen. Floodwaters from the Platte and Elkhorn rivers have forced the closure of U.S. Highways 77 and 275 on both the north and south sides of Fremont, and U.S. Highway 30 on the east and west sides of the city. Some Fremont police officers who live on the outskirts had to catch flights from the volunteer pilots so they could report to work, Newton said. Just one lane of U.S. Highway 30 west of town wasn’t totally covered with water, and law enforcement limited traffic on the road to ensure a route for gas, food, water and other essentials. U.S. Sen. Ben Sasse, who lives in Fremont, said he was working with the Trump administration in hopes of getting federal aid to Nebraska as quickly as possible. Sasse said he was concerned about the flood’s long-term impact and the problems that road damage could cause for farmers trying to get their products to market.